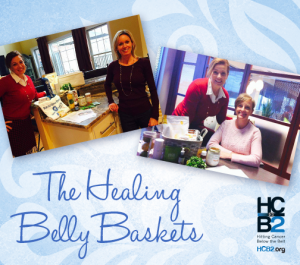 The Healing Belly Basket is our gift to cancer patients and survivors in the Richmond, VA area who are interested in taking initial steps to restore the gut microbiome, which helps to support a healthy immune system. The complimentary healing basket contains nutrient-dense, real food to help nourish the digestive system and assist in recovery. The cancer patients and survivors living in the Richmond area and surrounding counties are encouraged to complete the form below to request the gift of a Healing Belly Basket. The gut microbe colonies – our “good guy” bacteria – are easily measured and scientifically proven to play a vital role in fighting all chronic inflammatory diseases, including cancer. Changing the environment within the body to one that will not host cancer is critical. Let’s prevent disease the right way – by including gut-loving nutrition in the fight to prevent cancer or the return of cancer. Join our Facebook page “Healing Bellies” for continued support, and the sharing of ideas and recipes. Please also check out our Fight Right Anti-Inflammatory Grocery List and consider joining our Fight Right Stress Reduction and Nutrition Workshops for additional support! Coming in the Fall of 2019, Functional Fitness for cancer patients and survivors. Do you own a blender and use the blender to make shakes? Do you currently take or have you taken supplements? YESNOI don't like taking pills. What do you expect to learn from the delivery of the Healing Belly Basket? Do you understand the relationship between nutrition and immune support? Explain your level of interest in learning about and consuming foods which support the immune system and nourish the gut. Where do you primarily purchase your groceries? Thank you! Please share how you heard about the Healing Belly Basket so we can send them a thank you.